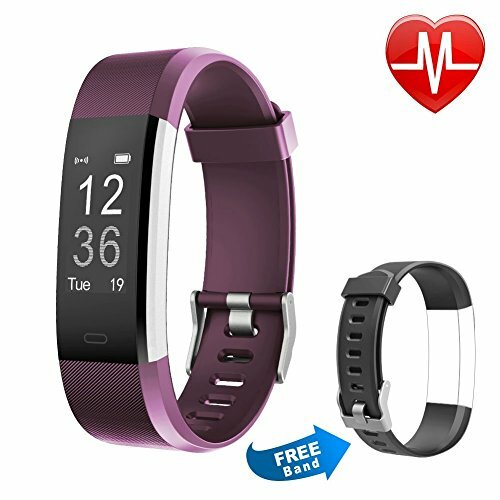 I have had a few enquiries on how to use the Letsfit Smart Band, therefore in a recent review of a fitness tracker that is essentially the same I have gone into much more detail on how to set up and use these budget fitness trackers, and the guide will work for this particular device too. After my disappointing experience with the Fatmoon DM58 I decided to give another cheap fitness tracker a go. This time around it is the Letsfit Smart Band which is priced at just £29.99 on Amazon. Unlike the Fatmoon the Letfit adapts a familiar fitness tracker design, similar to the Fitbit Charge HR. Unlike most big names like Fitbit, this tacker uses a standard USB plug for charging, you just pull the straps off to reveal the plug. This also allows you to swap out the bracelets for a different colour and Letfit supply a second bracelet. This is another nice touch as one of the main issues I have faced in the past with Fitbit is the poor build quality around the strap. Build quality feels good for a device of this price, it is not as nice as the Fitbit Charge, but there are no noticeable issues, and it feels like it won't fall apart any time soon. Unlike the previous cheap tracker, the Letsfit has an App located on Google Play store, so you have so you have some reassurance over the quality and security of the app. It also has over 100K users so, again; there is some proof that it is a quality App. Regarding permissions, it is no way near as bad as the Fatmoon, but if you want to use all the features, then you will need to accept a few. Setting up the device is quite straightforward, install the app, and just follow the instructions. I had it all set up without any issues within a couple of minutes. Within the settings, you can select what sort of notifications you can receive. This includes phone calls, text messages and also app notification. When I set up the app notifications, it didn't give me a choice of every app on my phone, but what appears to be the selected apps that Letsfit have chosen. For example, I was unable to enable notification from Telegram. In use it is quite easy to use, there is a little touch screen button to enable the display, and each press moves the menu along. You can start activities by long pressing on the selected menu item. The app itself is also well designed, it isn't as nice as the Fitbit App, but unless you are familiar with that, you will be more than happy with it. Within the app, you can see summaries of your activates, sleep and heart rate. You can then also go to the further details page which will show a graph of your progression over the week, month or year. There is a basic form of social integration, within the rank page you can view the top 20 users that Letsfit has recorded. This is just users of Letsfit and not your Facebook friends or your selected friends. While it is a nice feature to have, it doesn't offer much use, and this is where the Fitbit ecosystem outshines this cheap alternative. One of the big selling points of Fitbit is the competitive nature between the friends you know. For the price this is a fantastic little device, I would say it is orders of magnitude better than the Fatmoon DM58, and if you can live without the social features of Fitbit, then you can have a device offering the same functionality for a third of the price. This would make an ideal gadget for anyone wanting to get into fitness and monitor their activity, and I would personally say that the Fitbit Charge HR2 is not worth the £70+ premium regardless of its superior app and social features.